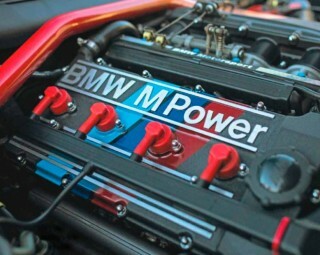 The E30 M3 is a car that we’re never going to get bored of featuring or writing about and we hope it’s car that owners never stop modding, because there are few things finer in this world than a perfectly-modded E30 M3. It’s another one of BMW’s designs that really needs very little work to get the best from it, but picking the right mods is essential and you need to have a keen eye and impeccable taste to ensure that you don’t make a mess of things. 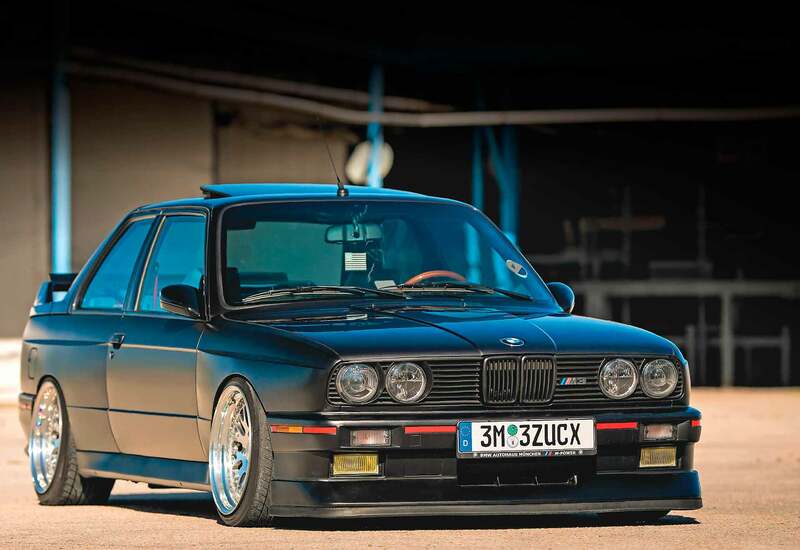 Just look at Raymond Khublal’s E30 M3 – it’s a stunning machine that’s been treated to the perfect selection of mods to make it at once individual and aggressive; it’s just oozing sheer retro goodness and this is a car that’s very easy to get excited about. For Raymond, cars have been a passion for many years, as he explains; “I have been interested in cars in general since I can remember, particularly the E30 model, as my mother had a 1987 E30 325i when I was growing up and I always loved the classic lines and quad headlights. Combing through the Bavarian autosport magazines growing up, I fell in love with the E30 M3 and it has been my dream car ever since,” so we’d say he had a pretty good motoring upbringing and it led to him owning a number of BMWs over the years. These have included a 1986 Euro E30, a 1984 E30 M3 replica and a 1997 E36 M3 Saloon and Raymond’s no stranger to modding, either; “My Euro E30 was modified with HRE 525 wheels, suspension, Steel grey metallic respray and a full M Tech 1 package. 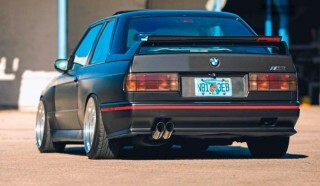 My E36 was a daily and it had suspension, Vaders and M Roadster wheels,” he says. “My first BMW was the 1984 E30 325i, which I was going to try to do an M3 conversion on; it ended up having too much rust so I got rid of it and continued my hunt to find the car I have now,” and we reckon it was for the best that conversion didn’t work out, because this is so much better in every way. Finding the right M3 was by no means easy, though, and this has been a serious undertaking that’s occupied a significant portion of Raymond’s life. “After searching for a good E30 M3 at a decent price and not finding one, then acquiring and getting rid of my E30 M3 replica, I was determined to find an E30 M3 and kept on the hunt until it was found. All in all, I was looking for over 10 years for the right one,” he says, and that’s some dedication. “My cousin actually found this one for me in another state – I purchased it right away and had it shipped to me, just from seeing the pictures. It was in good shape but had a two-tone respray that I was not fond of, but no rust. 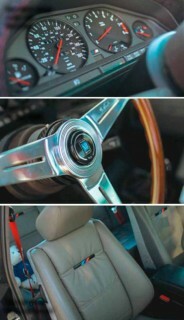 The interior was mint and it had the original S14 motor – those were the main things I was after. It also helped that it was the last year made, one of 272 produced for the 1991 model year,” and we can only imagine how satisfying it must have been to finally get his hands on the car he’d been wanting to own for so long. “My plan was to get a respray, fit some new wheels, lower it and enjoy it… It kind of spiralled out of control since then,” he laughs, but he’s definitely not complaining. So, let’s kick things off by talking about aesthetics because Raymond’s first job was to sort out that horrible-sounding two-tone paint job but, funnily enough, he’s almost done the same sort of thing himself anyway… Now, take a good, long look at the pictures of this M3 and you will realise that all is not as it seems because it’s been treated to a matt paint job, but only on the bottom half, with the top half of the car finished in original gloss Diamond black. It’s definitely different, but we like it and while this wasn’t Raymond’s end goal for the car’s looks, he’s also grown to love it and has no plans to change it anytime soon. “I decided to do the flat black as a temporary paint job until I could do the full engine/windows out respray in the original Diamond black finish. The look really stuck with me and its been on the car for a number of years; it looks very aggressive and complements the boxy lines of the car,” he says and we have to agree. Obviously it’s not going to be for everyone, but It is for Raymond, which is all that really matters, and it looks good. Of course, the car’s overall appearance has been significantly enhanced with a rather tasty selection of styling mods and while they are subtle and largely OEM additions, they really do an awesome job of giving this E30 M3 some additional muscle and presence. Starting off at the front we have that Evo 2 front lip spoiler, which is joined by Euro crosshair headlights, French fog lights for that retro yellow tint, and Euro grilles. Moving down the car you’ll spot the AC Schnitzer mirrors and at the back sits the magnificent Sport Evo spoiler with adjustable Gurney flap. Then there are further additions that it’s easy to miss, like the Evo bonnet seals, the Startec tinted rear lights and the Euro towing eye covers. There’s a lot of attention to detail with these mods and they all work together so well, with the end result being one devastatingly good-looking E30 M3, and Raymond has really done a fantastic job on this car. His decision to go with the stepped lips on the CCWs was a really good one because, as he says, that allows them to retain the 16” faces and so the wheels look a lot smaller. We have no size preference when it comes to E30s, they can even look good on the right 18s, but we do agree that, generally speaking, smaller wheels tend to suit the classics that much better. We also love the fact that he’s made the conscious decision to go for something different for his wheel choice and it’s really paid off. Enhancing the appeal of those CCW splits is the serious drop that has been applied and the way this car sits, the stance of it, really gives it a massive boost in terms of aesthetics. “I went with the tried and true Ground Control coilovers with Koni adjustable struts,” says Raymond. “The car also has Suspension Technique anti-roll bars front and rear with reinforced mounting points, upgraded end links and bushes. I also installed a HIK severe duty front skid plate tied to the frame rails via a roll bar hoop – this has saved my oil pan countless times,” he grins and we’re not surprised he needed that considering how low his M3 sits, but it’s absolutely worth it. Sticking with aesthetics, the interior is another area where Raymond has put in a lot of work and, as with the rest of the car, there are plenty of individual touches that really set it apart. “I wanted to keep it OEM but go for a bit of customization and practicality,” he tells us. “I decided to add E46 bits, like the centre console, armrest, illuminated gear knob, handbrake handle etc. and then wrapped those, the dash and some other parts in suede with M stitching. To tie it all in, I modified a set of E36 M3 Motorsport belts in red to finish it off as well as adding a custom audio system,” and that’s a seriously nice selection of upgrades, with some quite unusual additions. The idea of mixing in some E46 components is not a common one, but it works really well here, while all that suede definitely adds a much more luxurious feel to the cabin and the M stitching delivers the perfect final flourish. There’s loads more to enjoy in here, like the custom suede door card inserts, Evo door sills, leather door pulls and door trays and that retro Nardi steering wheel, and the interior is actually Raymond’s favourite part of the whole car. “I love the M stitched dashboard and interior pieces, I love the way the interior looks every time I get behind the wheel,” he smiles and we don’t blame him as this is one seriously nice cabin. Last, but not least, we come to the S14 that’s sitting under the bonnet; now, S14s tend not to get treated to much in the way of mods, which is understandable as a lot of people want to preserve this iconic engine and it’s also not the easiest motor in the world to mod, and while Raymond hasn’t done too much to this furious four-pot, he’s making plans for something very exciting … “I’ve powder coated the valve covers and intake manifold with M stripes, added a Samco silicone hose upgrade, a Supersprint exhaust, AFE intake filter and Shark chip. It’s fun, but honestly still slow,” he says. “As I am not a fan of swapping the S14 motor, next on the list is an RMS supercharger with supporting fuel, management and exhaust modifications, which will be installed by summer of this year,” and now we’re talking. Supercharged S14s are something of a rarity, with most people simply opting to swap in a different engine completely, which can give you more power with less effort but very much changes the character of the car, and you lose a big part of what makes the M3 experience as intense and thrilling as it is. The RMS supercharger will still give Raymond a high-revving S14 to enjoy, but there will be rather a lot more power to play with and, with the right supporting mods, he’s probably going to have somewhere around 350hp which is going to make this an extremely exciting machine to drive. Raymond’s E30 M3 journey has not been a quick or easy one, but it has been time well spent. After hunting for over 10 years for the right car, he’s spent another seven years modding it and he’s actually been hoarding parts since before he even bought the car, so this has been a very long-term project, but the awesome end result was more than worth the wait. Owning an E30 M3 was a dream of Raymond’s for so long and he’s not squandered his time with the car and has worked damn hard to create his perfect machine. It’s a real beauty, packed with some must-have mods along with a whole selection of really individual additions that make this car stand out in the best way possible. Having spent so long on this build, and with that supercharger coming soon, you might think that Raymond is about to take a well-earned break and rest on his laurels for a bit, but that’s not how his brain works. “Along with the supercharger I’ll be adding race pipes, fuel and engine management. Maybe a different look with the paint before I pull the trigger on a full respray. Eventually I would like to build a custom roll-cage setup for it and big brakes,” he says. It’s clear there’s a lot more to come and he’s going to be busy with his M3 for a long time to come, and we get the feeling he couldn’t be happier about that. S14 has received some minor mods Refurbished gauge cluster with black rings Retro Nardi steering wheel Front seats have been reupholstered. 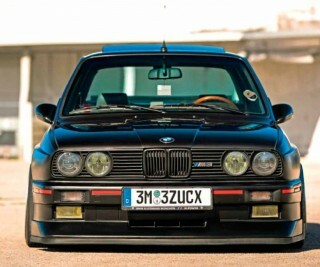 This M3’s stance is sheer perfection. 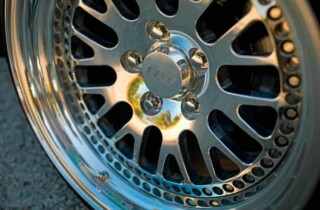 Gorgeous CCW Classic 17s. 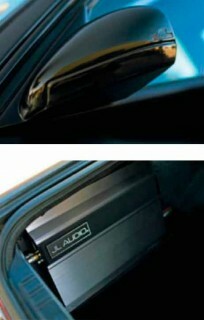 JL Audio amp. Crosshair headlights and French fogs.